Last week we went up to Broadcasting House in London and met the nice people behind the Radio 4 show ‘Click On’. The show explores the latest developments in from the world of information technology, and how these affect our lives. We were interviewed about the latest project TalesofThings, where you can tag anything and everything and leave your memories attached to objects. As part of the tagging architecture side of the work we officially ‘tagged’ broadcasting house. 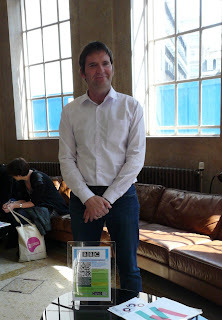 The TalesofThings qrcode is now in the lobby, pictured left is the Click On presenter Simon Cox. Using our free iPhone app you can record your memories of the building. Indeed, you can tag anything – TalesofThings provides a free, quick and easy way to link any media to any object via small printable tags known as qr codes or rfid labels. How about tagging your old antique clock, a building, or perhaps that object you’re about to put on eBay. Last week we placed a tag on a wall in Camden Town, London which brings a long lost Banksy back to life, the tag can be scanned and new memories attached to it. Its an easy way to create a new type of network in the city. Click On is broadcast Mondays at 4.30pm on Radio 4 with the podcast available shortly after.